2016 will mark the last year of the Presidential Dollars with the final three presidents to be minted: Richard Nixon, Gerald Ford and Ronald Reagan. Some may not realize this, but this is the 10th and final year of the Presidential Dollar Series. Most people have probably not even seen a Presidential Dollar, partially because the US Mint stopped putting in circulation in 2012. Like the Sacagawea Dollars , the Presidential Dollar would never be in demand. Anyway, let me give you a brief history of the Presidential Dollars. With the popularity of the Statehood Washington Quarters , Congress passed the Presidential $1 Coin Act of 2005. This bill would allow the US Mint to produce dollar coins of each US President in the order that they served. The Senate and House both passed it and President George Bush signed it into law on December 22, 2005. This bill was passed in hope that the dollar coin could be popular again. Unfortunately, the Sacagawea Dollar was never in demand, but is still being minted as of today. This new dollar coin would be the same diameter, composition, weight and writing on the edge. 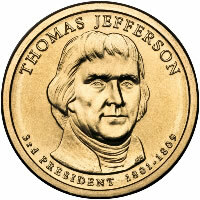 Looking at the coin, some people would call them gold dollars because of its color. Sadly, there is no actual gold in these coins. It is composed of 77% copper, 12% zinc, 7% manganese and 4% nickel. 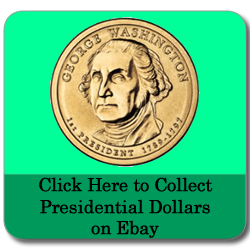 The first coins were minted in 2007 with the first four Presidents and every year after would have four Presidents released except for the last year with the final three. 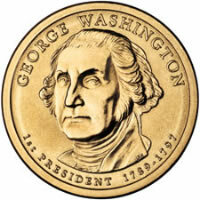 The original obverse of the coin showed the face of the President with his name on top and on the bottom was the numeric order when he was President and the years he was in office. On the reverse, instead of the word Liberty would be a design of the Statue of Liberty. The reverse would remain the same throughout the set. On the edge had the year and mint mark of the coin as well as “E Pluribus Unum” and “In God We Trust”. At least 50,000 of the George Washington coins are missing “In God We Trust” on the edge making them known as godless dollars. 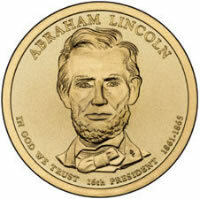 In 2009, “In God We Trust” would be moved to the bottom of the obverse of the coin. In 2011, the dollar was hardly being used and very few people would consider using them. Vice President Joe Biden would announce the the dollar would no longer be minted in circulation. So, 2012 would be the first year that only collectors could buy them through the US Mint. This way they could finish the set as planned even though it would no longer be seen by the general public. With the stipulation from the original act of 2005 saying that only deceased Presidents would be included, Ronald Reagan would be the last President on the dollar coin. Presidents Jimmy Carter, George HW Bush, Bill Clinton, George W Bush and Barack Obama were still alive and will not be included. , the Presidential $1 Coin Act of 2005 included a clause to mint the $10 Gold First Lady Coins (aka First Spouse Gold Coins). They would be released the same time as their Presidential husbands. As the Presidential Dollars may be more appropriate for collectors, the $10 Gold Coin could be more appealing for investors. 2007 was the only year that saw over 10,000 of each First Lady coin was minted. 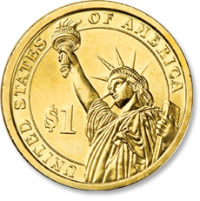 Unlike the Presidential Dollar, the reverse of the $10 gold coins would be different on each coin. Three Presidents, Thomas Jefferson, Andrew Jackson and Martin Van Buren served after their wives passed away . So, in their place would be a depiction of Liberty that appeared on coins when these men were President. Jeffersons would be the . Jacksons would be the Bust Liberty design and Van Burens would be the Seated Liberty design. Chester Arthur’s wife past away before he became President. In her place was Alice Paul, a 20th century suffragist who was born while Arthur was in office. John Tyler and Woodrow Wilson would have two wives during their terms in office. The US mint would issue coins for both wives which would make them end up releasing five coins those years instead of four. There was some controversy in 2015 about having Nancy Reagan on a coin because she was still living. Back in the beginning, they weren’t including Ronald Reagan on the dollar coin, possibly because his predecessor, Jimmy Carter was still alive, or that his wife was still alive. In any case, it was agreed to include Ronald Reagan and breaking tradition, Nancy Reagan would be the first living person to appear on a US coin that was not a commemorative. Ironically, Nancy Reagan passed away in March, 2016, a few months before her coin would be released. Would you Consider Collecting or Investing in these Coins? Like I said previously, The Presidential Dollars would be more for collectors and the $10 Gold First Lady Coins would be for investors, though some investors are skeptical. However, there have been errors on the Presidential Dollars beyond the early godless coins, especially on the edge. Of course, with errors, there are counterfeit coins, so make sure it is an actual error. Well, I hoped you liked my post on Presidential Dollars . After this year, they will no longer be minted. As far as I know, the Sacagawea Dollars will still be minted next year. What do you think they should put on the dollar in place of the Presidents, not that I know of anything else coming in the near future. Is The US Mint Thinking Of The Collector? Hillary Clinton of courseeeee!!! LOL! Wow, I really enjoyed this article! Had to read it aloud even. I didn’t even know that there were lady coins printed, let alone see one! And I can’t believe there was controversy over if they were dead or alive. Like in the beginning, they should’ve just kept the sequence of going with 4 presidents at a time. Sad to know they stopped printing them; I just recently spent the last one I had a few weeks ago. If I find one again, I’ll surely be holding onto it. Hmph! Hey Ashlee! The controversy of having a living person on a coin goes all the way back to when George Washington was president and the US mint was relatively new. They wanted to put Washington’s face on the silver dollar, but he refused. He didn’t think a person’s face, living or deceased should be on a coin. This is probably because British coinage has the face of the king or queen on the obverse. He probably wanted to stay away from some of the laws of the British, seeing that the US declared their freedom a few years before. Hey KCorina, I didn’t knew that there where that amount of presidents in the dollar coins, I don’t live in United states and I’ve never have a dollar in a form of coin in my hands (Just a quarter of dollar), but that’s great to know the currency of other countries. Hey Saul! I can bet a lot of Americans haven’t even seen these coins. Unfortunately, these coins never became popular, except to collectors. Really interesting article on the minted coins. I had no idea these even existed, let alone all of the interesting history behind them. 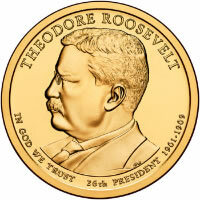 Since they decided to break the living person rule, is there any chance that they will continue on with the coins for some of the presidents who served and are still alive? No. This will be the last year of the Presidential Dollars. They only included Nancy Reagan’s $10 gold coin to coincide with Ronald Reagan’s dollar coin. Maybe if there was more demand with these coins they might had considered the current living Presidents. The act said only deceased Presidents. I would personally love to collect these mint coins and more! I metal detect and always looking for more coins for my collection. These are so nice and amazing looking I would drop a paycheck in a heart beat lol I think my all time favorite is Mercury Dimes but these will make a great addition to my collection. Hey Mitchell! That’s cool that you metal detect. You’ll have to leave me know what you find. My friend has 2 metal detectors, one for land and one for water. He lives it. I like Mercury Dimes but haven’t collected many. One guy brought a complete set to my local coin club. Even had the rare 1916-D. I hope to do a post about them in the next week or two, so check back. ← PCGS Will Pay You $10,000 Just To See This Coin!